I’m very excited to present this brand new glow in the dark pin! 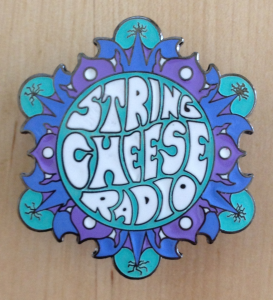 This pin was designed by long time cheesehead, artist, and friend of String Cheese Radio Ryan Kerrigan. The pin measures 1.5 inches in diameter and is printed on high polished black nickel. The teal color is glow in the dark! Limited run of 100 pins. The pins are individually numbered and stamped with the artist’s signature. The proceeds from these pins will go towards the costs of running the radio site as well as funding future contests and giveaways. Thanks for your support of String Cheese Radio! Unfortunately, these pins are sold out. Thanks for your support.